This is less a news update than a punchline. Congress is seeking to help bail out broke pension funds? This has to be a joke, right? A completely broke organization that routinely shuts down because it has no money, that already is utterly buried in unfunded obligations it can never meet for Social Security, its own version of America’s universal pension fund, seeks to give away money to private entities? No wonder they’re not publicizing this headshaking bout of corporate welfare one whit. As the government was working on the recent, new budget deal and subsequent boost in government spending, Congress quietly snuck in a provision that forms a committee which would use federal funds to bail out as many as 200 “multiemployer” pension plans. As is often the case, this rescue “plan” is too little too late. 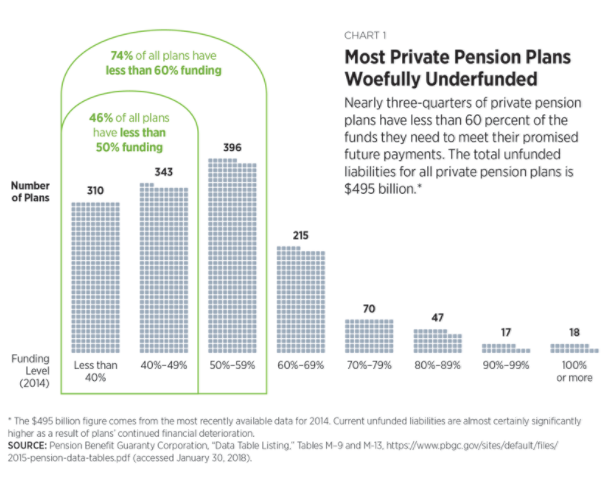 The US pension system is beyond repair. Boston College estimates the nation’s 1,400 multiemployer plans (corporate) are facing a $553 billion shortfall. And around one-quarter of those are in the “red zone,” meaning they’ll likely go broke in the next decade or so. But Congress’ committee, assuming it works, wouldn’t even rescue the red zone plans, much less the remaining 1,200. And it doesn’t even begin to address the real problem – the $7 trillion funding gap faced by the government’s own pensions.